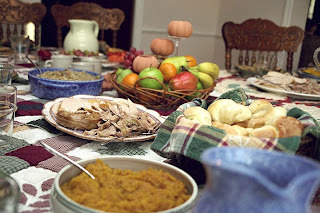 Double X Science: Turkey, spice, everything nice: What are those Thanksgiving smells made of? Turkey, spice, everything nice: What are those Thanksgiving smells made of? Traditional Thanksgiving food. Just looking may evoke smell memories. Via Wikimedia Commons. Spices, turkey, stuffing, those casseroles you never make at any other time of the year. What is it about the smells at Thanksgiving that are so evocative that if you encounter them any other time of the year, your mind flies back again to memories of family, friends, and a turkey or Tofurkey? Smells are particulate--transporting their odors with them are molecules with mass that physically attach to molecules in us that recognize them. There's a definite ewww factor to that, but like all smells, the best and most pleasant memory-evoking odors--chocolate chip cookies, warm spice, fire in the grate--have no gatekeeper. The particles that bear them connect directly with proteins on your neurons that fire a message to your brain that says, "Coookies!" But that message has intricate links with other parts of your brain and may also zoom you backward in time to memories that otherwise would never emerge from those corners where they lie obscure, until...that smell revives them. I know that smelling firewood smoke and spice takes me into a general holiday mood. But the smell of cornbread baking in an iron skillet wakens reminiscences that are almost as old as I am. They are recollections I'd never review if it weren't for that direct line to my brain that those odor-carrying molecules have. Our sense of what we smell can be quite complex. There's a concept in science known as emergent properties. These are the unpredictable outcomes of a combination of components. A neuron (nerve cell) is just a neuron, but packs of them together in various permutations result in the emergent and complex properties that each of us comprises. Sodium is a pretty nasty metal and chlorine is a really nasty gas, but put one of each together to make sodium chloride, and you've got table salt--a necessity of life and a necessity of any decently flavored Thanksgiving dish. The properties that emerged from these two elements combined were unpredictable but delicious. Smells are the same way, with unexpected properties emerging from their combined onslaught and our chemical reception of them. Bombarding us with their chemical possibilities, processed through hundreds of our neuronal proteins designed to recognize and receive their messages...it's an invisible world that tells us more than we realize about everything around us...and wakens our memories of Thanksgivings long past. What smells evoke unexpected memory for you? As you ponder, we here at Double X Science wish you a very happy, contented Thanksgiving, with delicious smells that construct pleasant new memories in the corners of your minds.